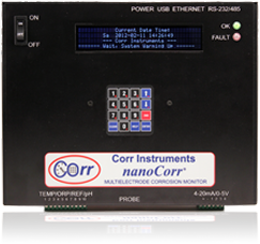 Backed by at least one of the 8 corrosion sensor patents wholly owned by Corr Instruments, our nanoCorr® analyzers and field monitors are widely used for online and real-time localized and general corrosion monitoring. These ultra-high precision instruments measure extremely low currents in the pico-ampere levels, which can be translated into a corrosion rate as low as a few nanometers per year, in some applications (PDF). 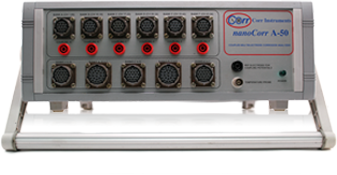 Our analyzers and monitors are based on the patented coupled multielectrode array sensor (CMAS) technology which measures the flow of electrons from corroding electrodes to one or more cathodes. 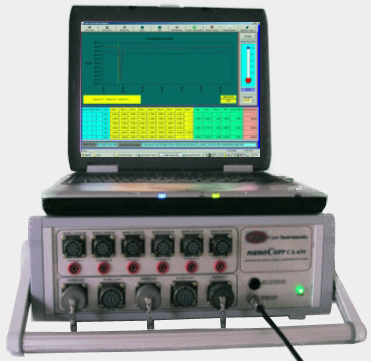 The corroding electrodes in a CMAS Probe simulate the anodic sites of a corroding metal. This technology is especially suitable for localized corrosions, which cause the majority of catastrophic corrosion problems in industries, and for most types of general corrosions. 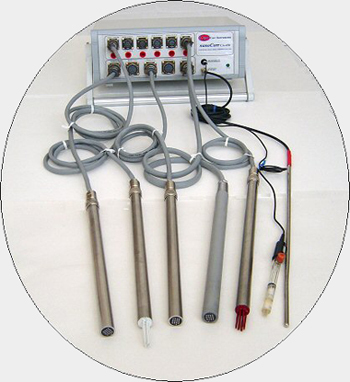 These CMAS Probes have an extremely long life and can be flush-mounted so they do not require retrieval for maintenance in field and plant applications. They can also be polished and reused in different solutions, for an unlimited number of times. 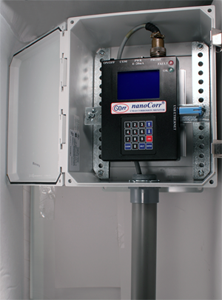 Thanks to CMAS technology, nanoCorr® Analyzers and Monitors have made possible the online and real-time monitoring of localized corrosions and data interpretation by laboratory testers and field operators. Click the thumbnails to view a larger picture. Data Storage: Requires a dedicated computer. 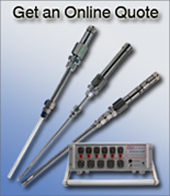 Applications: Laboratory- and field-use. For higher resolution measurements. copyright © 2003-2018, Corr Instruments, LLC, Carson City, NV, USA, All rights reserved.